Amtrak photo courtesy of Alex Mayes. Eleven hours may seem like a grueling amount of time to be on board a locomotive, especially when you can drive to Santa Barbara in roughly six, but with a dozen train rides under my belt, including a three-day voyage from Sacramento to New York, I like to think I’m somewhat of an Amtrak aficionado. Something about the chug-a-chug rhythm of the train swaying along the tracks and passing through our country’s back roads is cathartic, and not dealing with irrational drivers, outrageous gas prices, or stripping down for airport security provides a breath of fresh air, too. If your wallet allows, I advise you book a room in the sleeping car (especially for lengthy or overnight trips). The complimentary meals in the dining car, fresh linen and towel service, and access to the Pacific Parlour Car – featuring Internet access via AmtrakConnect, daily wine and cheese tasting, plus a specialty coffee bar and onboard theater – is well worth the extra coinage. Santa Barbara pier - Photo courtesy of the Santa Barbara Conference & Visitors Bureau and Film Commission. On this trip, however, coach class was calling for my penny-pitching budget, so I came prepared with plenty of snacks, beverages and entertainment. After settling into my oversized seat and pulling out of the Sacramento train depot, I witnessed the sun slowly awaken – the first time in a long time I truly observed and appreciated the beauty of a sunrise. Although the dining car (sit-down, white tablecloth service in a communal setting) was tempting me with its Classic Railroad French Toast and Continental Breakfast, I opted to grab a coffee, muffin and fresh fruit in the more casual café car. The next 11 hours drifted by just fast enough, allowing much-needed time to journal, read, play cards in the glass-topped lounge car (Amtrak’s social mecca), and enjoy the pastoral scenery of northern and central California’s farmland and rolling hills. The superb people watching also helped pass the time. On my collection of train trips, I’ve witnessed and interacted with a melting pot of individuals: Amish families, retired couples, backpacking nomads, and once sat next to Ron Popeil (inventor and founder of Ronco). You never know what you’re going to see or whom you might meet. Approaching Santa Barbara, a.k.a. the “American Riviera” – just in time for a sherbet-hued sunset – the dramatic Pacific and a handful of surfers came into view. La dolce vita, I thought to myself. Surprisingly, when the conductor announced we’d arrived, I was excited but not overly eager to leap off; it’d been a day unlike most, one where I actually calmed my mind and stopped to appreciate the small things, a day truly about the journey and not the destination. From the station, I was at the heart of the city and within walking distance to Stearns Wharf, Santa Barbara Harbor and State Street. There were heaps of hotels nearby, many which offered a discount with proof of car-free travel, as well as free transportation to and from the Amtrak station. I bunked up at one of the more affordable, yet modern options: Presidio Motel. Boasting 16 rooms, each decorated by local artists in their own whimsical, funky style; a boutique shop, Supply Room, in their lobby; French pressed coffee, tea and soy milk in the mornings; plus, complimentary beach cruisers, this renovated motor lodge is anything but ordinary. 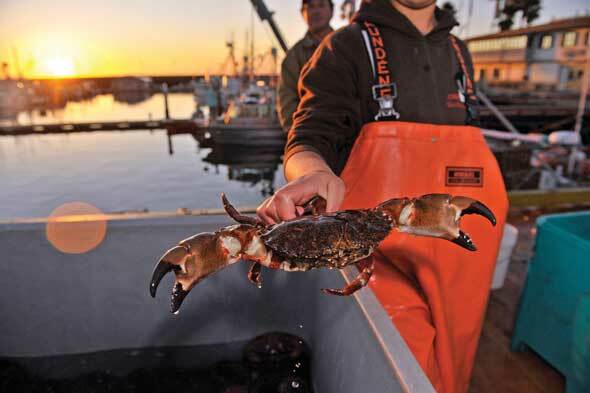 Harbor crab - Photo courtesy of the Santa Barbara Conference & Visitors Bureau and Film Commission. With locally grown produce, the ocean and diverse cultures all within reach, it’s no wonder the Santa Barbara dining scene blew my taste buds away. For superb sashimi and stellar service, I rolled into Arigato Sushi, and when a waterfront view and sustainable seafood called my name, Brophy Bros. answered. Also muy bueno were the authentic tacos crafted on handmade tortillas at La Super-Rica Taqueria, a food stand often frequented by the late Julia Child. In a city chock-full of restaurants and bars that run the gamut from casual to classy, there’s no going hungry (or thirsty!) here. Sunshine made my itinerary every day, and I took full advantage by pedaling through town on one of Presidio Motel’s bikes. Stops included the “Queen of the Missions,” Mission Santa Barbara; shopping for beachy-chic fashion at the promenades and open-air plazas on State Street; ascending the Santa Barbara County Courthouse’s tower for 360-degree views of the city, ocean and Santa Ynez Mountains; and finally a picnic lunch (followed by a snooze) on the sand. When wine-o-clock hit, I cruised along the Urban Wine Trail to a handful of tasting rooms – all located within blocks of the beach and downtown. After a few sips of award-winning Pinot Noirs and crisp Sauvignon Blancs, it became clear what the buzz about Santa Barbara County wines is all about. The laid-back lifestyle, abundance of activities and Mediterranean climate of Santa Barbara had me at hello; saying goodbye to such a beautiful city was not easy. But the journey didn’t end when I climbed aboard my train – I had 11 hours to make more memories and daydream of the beach…and my next Amtrak adventure.